Elemental carbon appears in many forms, including diamond, fullerenes and graphene, which have unique structural, electronic, mechanical, transport and optical properties offering a broad range of applications in physics, chemistry and materials science. These include composite materials, nanoscale light emitting devices and energy harvesting materials. Within the "carbon family," only carbyne, a truly one-dimensional form of carbon, has not yet been synthesized despite having been studied for more than 50 years. Its extreme instability in ambient conditions rendered the final experimental proof of its existence difficult to achieve. An international collaboration of researchers has developed a novel route for the bulk production of carbon chains composed of more than 6,400 carbon atoms by using thin, double-walled carbon nanotubes as protective hosts for the chains. These findings are published in the journal Nature Materials and represent an elegant forerunner toward the final goal of carbyne's bulk production. Besides the potential applications, these findings open the possibility to answering fundamental questions about electron correlations, electron-phonon interactions and quantum phase transitions in one-dimensional materials. Even in its elemental form, the high bond versatility of carbon yields many well-known materials including diamond and graphite. A single layer of graphite, termed graphene, can be rolled or folded into carbon nanotubes or fullerenes, respectively. To date, Nobel prizes have been awarded for fundamental work on both graphene (2010) and fullerenes (1996). Although the existence of linear acetylenic carbon, an infinitely long carbon chain also called carbyne, was proposed in 1885 by Adolf von Baeyer, who received a Nobel Prize for his overall contributions to organic chemistry in 1905, scientists have not yet been able to synthesize this material. Von Baeyer even suggested that carbyne would remain elusive, as its high reactivity would always lead to its immediate destruction. Nevertheless, carbon chains of increasing length have been successfully synthesized over the last 50 years. So far, the record holder is a chain made of around 100 carbon atoms (2003). This record has now been broken by a factor of greater than 50 with the first-time demonstration of micrometer-scale chains, reported in Nature Materials today. Researchers from the University of Vienna led by Thomas Pichler have developed a novel and simple approach to stabilize carbon chains with a record length of more than 6,400 carbon atoms. They use the confined space inside a double-walled carbon nanotube as a nanoreactor to grow ultra-long carbon chains on a bulk scale. The existence of the chains has been unambiguously confirmed by using a multitude of sophisticated, complementary methods. These include using temperature-dependent, near- and far-field Raman spectroscopy with different lasers (for the investigation of electronic and vibrational properties), high-resolution transmission electron spectroscopy (for the direct observation of carbyne inside the carbon nanotubes) and X-ray scattering (for the confirmation of bulk chain growth). "The direct experimental proof of confined ultra-long linear carbon chains, which are two orders of magnitude longer than the longest proven chains so far, are a promising step toward the final goal of unraveling the holy grail of truly 1D carbon allotropes, carbyne," explains Lei Shi, first author of the paper. 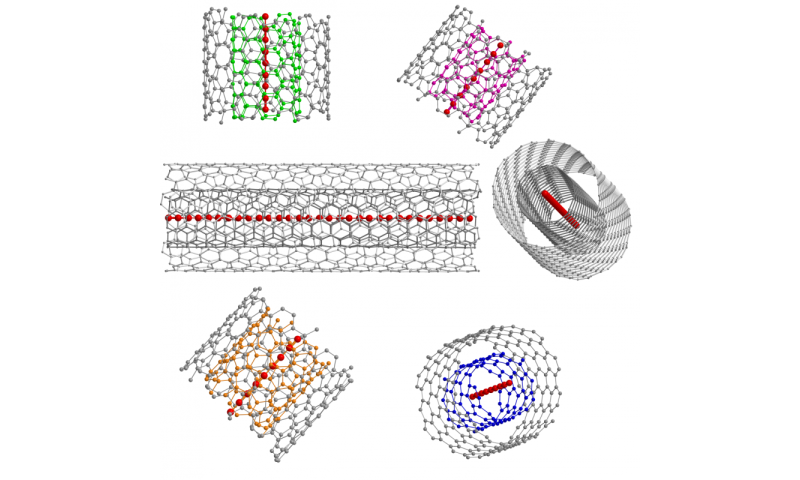 Carbyne is very stable inside double-walled carbon nanotubes. This property is crucial for its eventual application in future materials and devices. According to theoretical models, carbyne's mechanical properties exceed all known materials, outperforming both graphene and diamond (for instance, it is 40 times stiffer than diamond, twice as stiff as graphene and has a higher tensile strength than all other carbon materials). Carbyne's electrical properties depend on the length of the one-dimensional chain, thus suggesting novel nanoelectronic applications in quantum spin transport and magnetic semiconductors, in addition to its general appeal in physics and chemistry. "This work provided an example of a very efficient and fruitful collaboration between experiments and theory in order to unravel and control the electronic and mechanical properties of low-dimensional, carbon-based materials. It led to the synthesis and characterization of the longest-ever linear carbon chain. These findings provide the basic testbed for experimental studies concerning electron correlation and quantum dynamical phase transitions in confined geometries that were not possible before. Furthermore, the mechanical and electronic properties of carbyne are exceptional and suggest a wealth of new possibilities for the design of nanoelectronic as well as optomechanical devices," concludes Angel Rubio.